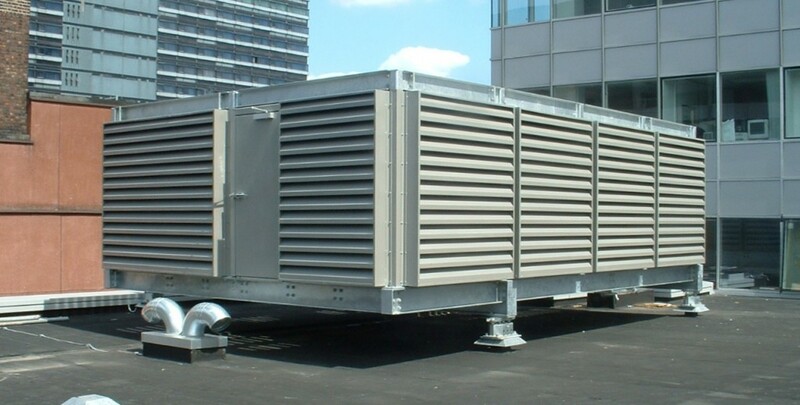 Acoustic louvres for the new plant decks on the roof of Saint James House (George Street / Faulkner Street) Manchester, all as part of the refurbishment and upgrade of this commercial property by a prominent Cheshire based estate management services company. 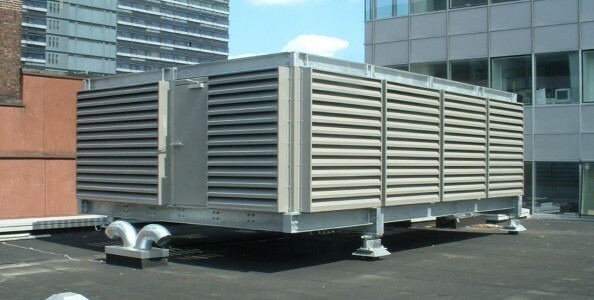 To survey (both dimensionally and acoustically), supply and install the acoustically absorptive louvres needed to encapsulate and attenuate the two external roof top plant decks on which building cooling equipment is seated (Plant decks approximately 7.5m long, 5.0m wide and 2.5m high). Full site survey to confirm noise levels, airflow information, the positioning & dimensional accuracy of the plant decks and their superstructures, access for cranage, traffic control, barriers & other details for a City of Manchester installation. Louvre casings fabricated from light gauge pre-galvanized plain & perforated mild steel. Semi aerofoil acoustic louvre blades designed to promote air flow through the assembled louvres. Inert, non-combustible, non-hydroscopic, vermin proof acoustic media, encased in a melinex membrane to prevent the ingress of moisture and the migration of mineral fibres into the atmosphere. Pre-galvanized steel mesh birdscreen guarding to the rear of each louvre. Overall louvre construction to be fit for purpose in providing an appropriate noise reduction to neighbouring commercial properties in accordance with BS4142, to be structurally sound and capable of withstanding the relevant wind & snow loadings placed on this high level (roof-mounted) installation during adverse weather conditions. Louvre appearance to conform with the agreed architectural requirements, to be both aesthetically pleasing and harmonious with the parent structure / building, with no ‘line of sight’ through the louvres to / from the higher commercial properties nearby. Powder-coat finished in the customer’s corporate colours to provide a protective coating with a guaranteed minimum life expectancy of 15 years. The acoustic screen provided a noise reduction of 15dB, bringing operational noise levels of the new plant to 10dB below the existing ambient background level for day & night time, thereby avoiding complaints from neighbouring residential and commercial properties.